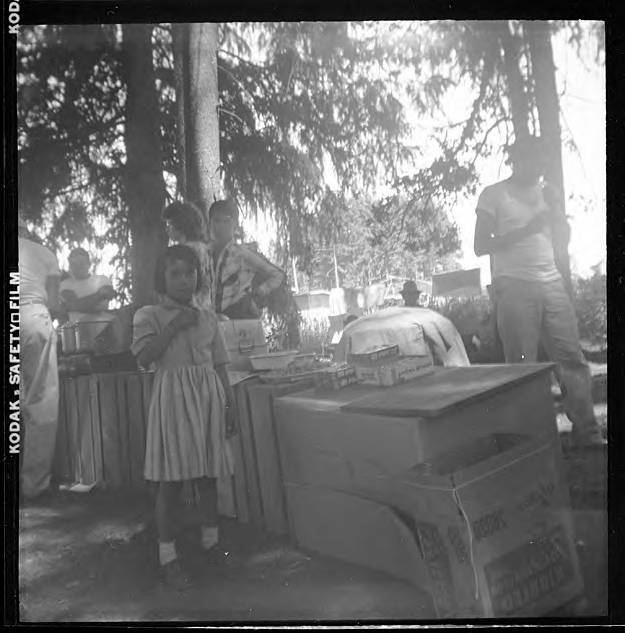 Black and white image of a young girl standing on front of a makeshift table made of crates and boxes. She wears a short dress, white socks and shoes. The table is piled with utensils and dishes of various kinds, and a people are gathered about it behind her. Tall pine trees shade the group. Museum records identify the people in the image as members of a group of 'potato pickers,' most likely migrant workers. Migrant farm labor has been an important part of agriculture in Washington County since the early 1900s, though the cultural groups which provide the majority of the laborers have changed over time.